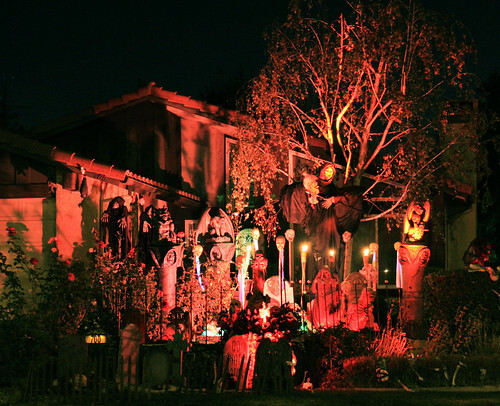 After dark, lighting will draw attention to your house as a Halloween hotspot – and it needn’t cost the earth. Christmas lights can be easily transformed to give a ghostly glow to any outdoor area. Freestanding Christmas lights can be covered with a coloured cloth to cast an unnatural light across your front porch or garden – but be sure to use porous materials or allow space to prevent overheating. Work Christmas fairy lights around the space, draping them over tree branches with scraps of old material or fake cobwebs. The key to a truly terrifying scene is not to over-light the area. Keep lighting moderately dim for a more mysterious ambience. 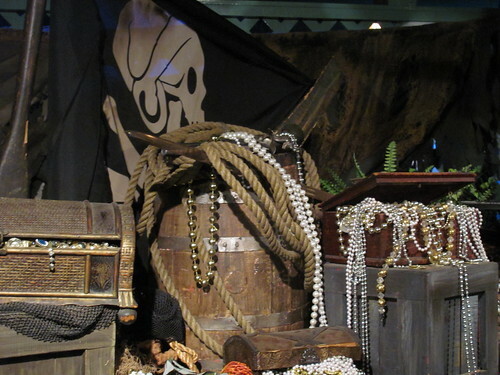 If you’re hosting a themed Halloween party, you’ll want decorations to match. Welcome your guests to a vampire fancy dress party with tombstones on your front lawn, made from recycled cardboard or polystyrene (which can be cut into for a 3D effect). Cover them with spray paint and ivy for a worn look. Nothing says Halloween quite like the humble pumpkin. Carving vegetables for Halloween is a centuries-old tradition, and the North American pumpkin, popular for its availability and comparatively large size, is now the standard vegetable of choice for carving on Halloween. Making Jack o’lanterns is a fun activity for young children (though they should obviously be supervised and not put in charge of any knives). Involve them by asking them to draw the scary face on the pumpkin, which you then cut out. If indoors, make sure surfaces are protected with plenty of newspaper. Cut a circle around the stalk of the pumpkin, keeping the knife pointed towards the core (this will ensure that the lid stays in place). Using a spoon, scoop out the seeds and flesh until the pumpkin is hollow. The seeds can be toasted and eaten, while the flesh can be used in a host of recipes. Now’s your chance to get creative. Sketch your design on the pumpkin first and then carefully cut it out. Usually this design is a menacing or grotesque face, but the possibilities are almost limitless. Bear in mind that the more you cut away the more fragile the pumpkin becomes. If art isn’t your forte, there are a number of designs online that you can trace or use as stencils. 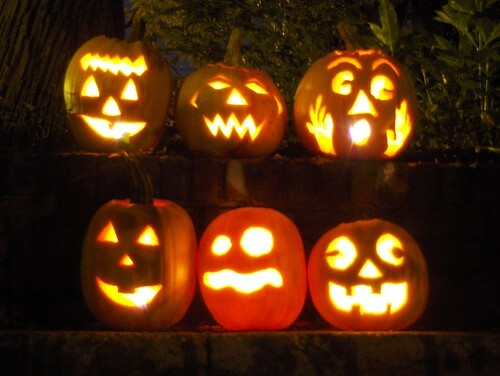 Once carved, pumpkins usually only last for a couple of days before decaying. Coating the cut edges with petroleum jelly, storing the pumpkin in the fridge or soaking it in a bleach-water solution means it’ll last longer. 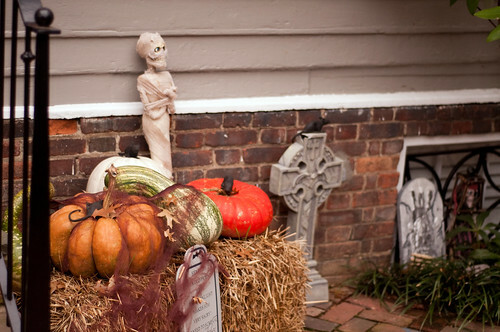 Place a small candle in the base of the pumpkin to light up the cut-out design at night. Try multiple jack-o’lanterns and experiment with different themes and images to make your decorations stand out from the crowd. Thanks for all the cool ideas. I’m going to do some of those for my house! !